Weddings are all about happiness and joy, but often the day brings so much emotion that the tears flow too! 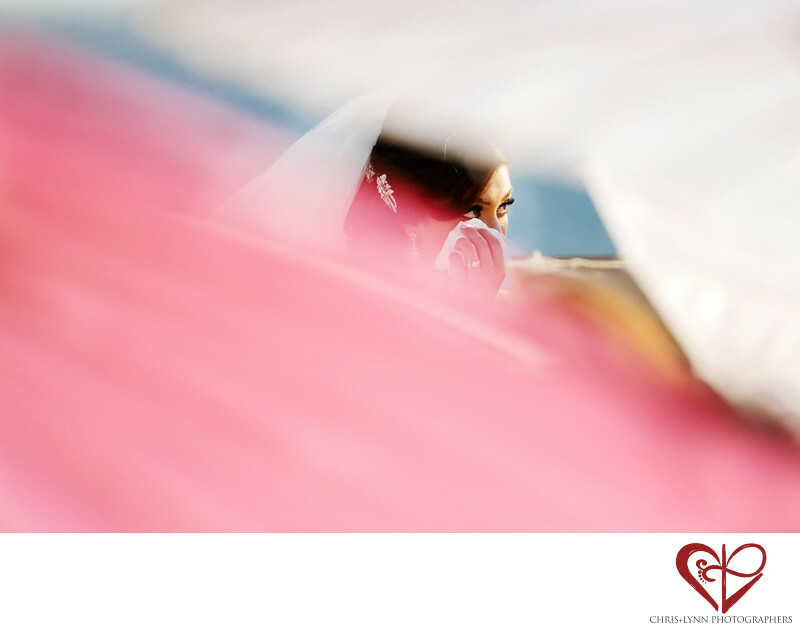 Capturing such personal and intimate moments is one of the privileges of being a wedding photographer in Cabo San Lucas. It is not easy to capture such ephemeral moments that sometimes last just a few seconds; especially when many people instinctively try to hide their strong feelings. Anticipating such fleeting moments means being in a constant state of concentration and awareness, especially during the ceremony. This image of a Persian bride brushing away her tears after the exchange of vows was taken with the Canon 70-300 mm lens from a terrace high above the ceremony site. The blur of bright fuchsia on the left and white on the right are the parasols held by the guests to shade them from the hot Mexico sun. The blue behind the bride is the Sea of Cortes backdrop. Together the three colors of pink white and blue form a kind of abstract frame around the bride, focusing all the attention on her & her beauty. While one photographer captures the big picture showing the entire scene of the ceremony, the other prepared this unique close-up composition in the expectation of the bride sharing emotion. I love how the intimate framing emphasizes this intimate moment of this Persian wedding in Cabo, Mexico. Location: Carretera Transpeninsular Kilometro 6.5, Cabo Bello Plaza del Rey 7 y 8, 23455 Cabo San Lucas, B.C.S., Mexico Sunset Monalisa. 1/2500; f/5.6; ISO 400; 277.0 mm.